WELCOME TO YOUR NEW CAREER AS A HEALTH OR SOCIAL SERVICE PROFESSIONAL! Drake Medox College was created from the growing demand of health care employers (like our sister company Drake Medox Health Services) for Health Care Assistants to meet the needs of clients/residents not only in the facility sector but also in the home support and private home care sectors. Today there continues to emerge even greater demand to meet the needs of our aging population and aging workforce in either multilevel care environments or in their own homes. Since our inception we have gone on to develop Community Support Worker and Activity Assistant Diploma Programs. The only programs we offer are health and social service related programs. You will benefit from the fact that our entire focus is specialized and our curriculums are backed by over 40 years of experience in the health and social service industries. Our vast connections with Employers, Health Authorities as well as regulatory bodies ensure our curriculums are updated as trends and policies within the industry change. At Drake Medox College we offer some of the most student focused study options for program delivery and support available in the industry. Combined Delivery of online plus in- class studies or in-class only options are available. Classes are available Saturdays or Sundays, evenings or weekdays; you decide what works for your schedule. Our Support team is ready to serve you 6 days a week at both our Surrey and Vancouver Campuses. 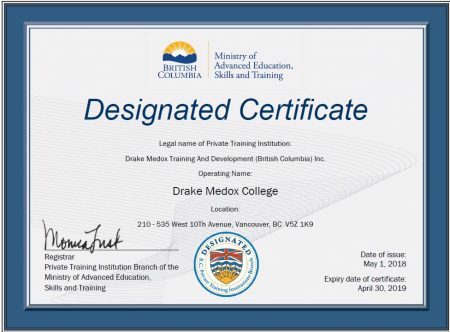 As a graduate of any Drake Medox College Program, you will be making a difference in the lives of people every day, and your care and support will be appreciated!